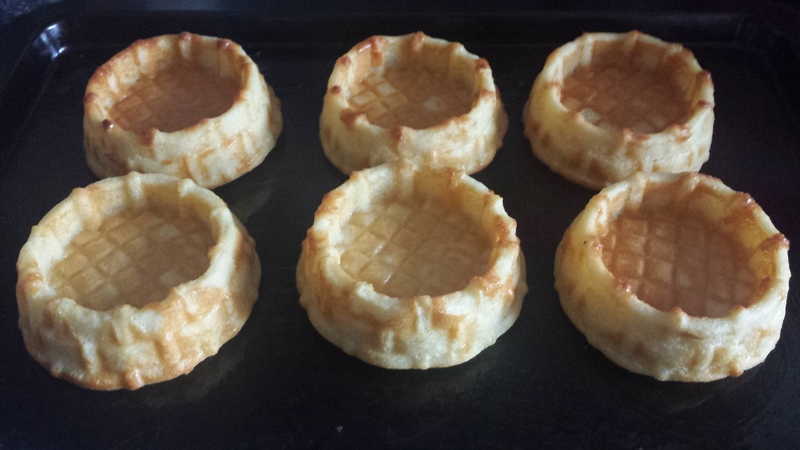 Nordic Ware Shortcake Basket Pan Waffles! 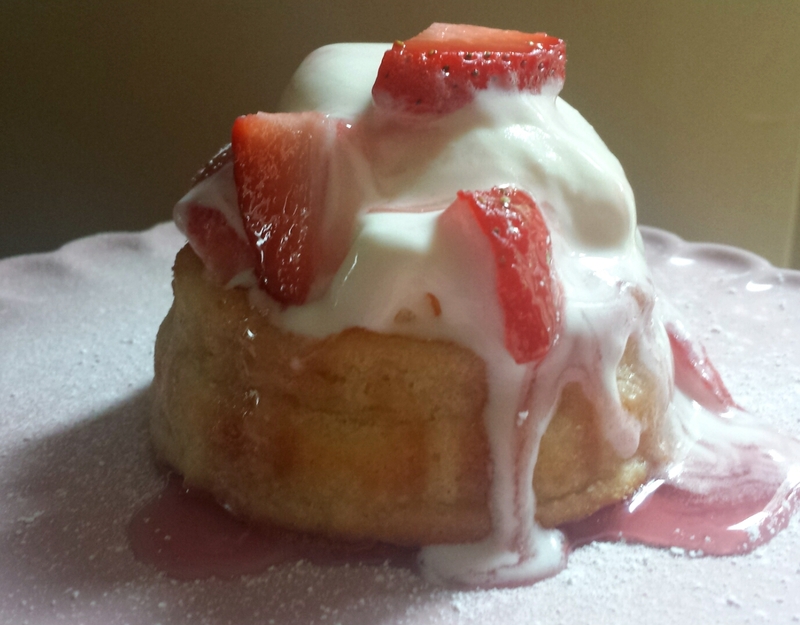 As I’ve said in a previous post, I love Nordic Ware pans and particularly love the shortcake basket one. The possibilities of ways to use it are endless. Today I decided to have a little experiment and see if my son’s favourite treat would work in it. I was ecstatic to see it does! Luke adores waffles. I bought a cheap waffle iron a while ago but it has become one of those poor items that gets put away at the back of a cupboard never to be seen again. It was just too much of a pain to use. Luke has had to suffer shop-bought waffles since. I know, I’m hanging my head in shame, don’t worry. Well he won’t have to suffer any longer as I just ate what you see in the picture above and the waffle was perfect! So light and fluffy inside but crispy on the outside, and it tasted divine! I’m extremely happy right now! So without further ado, here is the recipe. It makes enough for 12 basket waffles. Preheat oven to 200C. Use a pastry brush to coat the basket moulds with melted butter, making sure you cover all the nooks and crannies. In a large bowl, use a hand whisk to beat together the eggs, butter, buttermilk, and milk. Add the sieved flour, baking powder, salt, and sugar and mix well with the whisk until the batter is smooth and lump-free. Spoon the batter into the moulds of the pan, filling each three quarters full. (I used a dessertspoon to do this and it was about 4 spoonfuls in each). Bake in the preheated oven for 15 minutes, or until just starting to get a bit of golden colour. 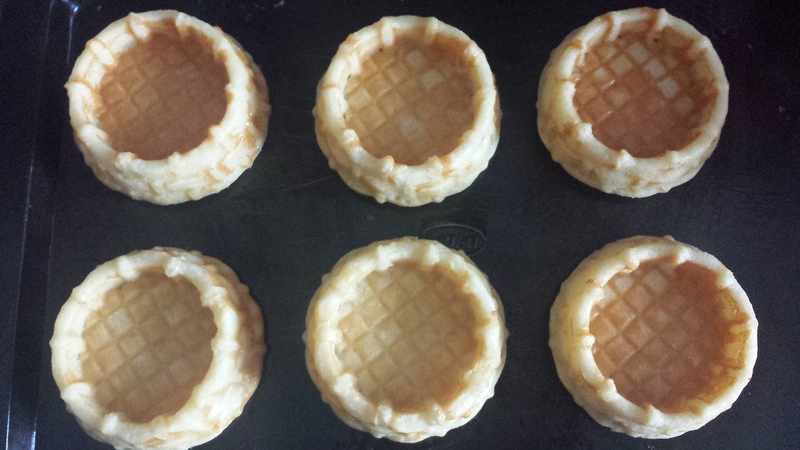 Remove from oven, invert pan on to a baking sheet and give each basket a sharp tap. Lift the pan and the waffles will be left behind on the baking sheet. Place the waffles back into the oven and bake for a further 5 minutes until they are a more golden colour and have crisped up a bit. This will help them to hold their shape. If like me you only have 1 of these pans, re-butter the moulds, beat the remaining batter again briefly, then fill the pan and bake as before. I added a scoop of ice cream, some strawberries and some strawberry syrup to mine while it was still hot so the ice cream melted all over it. You can add whatever toppings you like. These can easily be reheated by placing in the oven for 5 minutes to get warm and crispy again, as they will start to lose their crispness when they cool. Yum, yes please! Marvellous idea. I would eat these EVERY day if I could.